The One & Only - Leased Ferrari: Mark Dean Vica "My Mary"
Mark Dean Vica "My Mary"
One of Culver City, CA's dopest galleries BLKMRKT dropped an incredible exclusive print today (2/12) from twisted yet talented artist Mark Dean Vica. 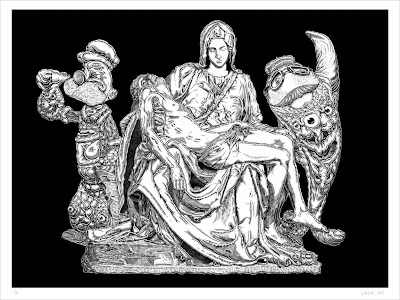 Mark Dean Vica's "My Mary" is available in Orange & Black as a series of 100 or in classic Black & White as a series of 10! Either way you can't go wrong, this print is CRAZY & it's only available at blkmrkt.